Teeth whitening is a common cosmetic dental treatment used to whiten your smile. If you have ever wanted whiter teeth, it’s possible to achieve when you’re in the hands of a qualified dental practitioner. A general consultation involving a professional check-up and clean will be recommended before a whitening treatment is given. Philips Zoom™ teeth whitening is a procedure carried out in the dentist chair that’s quick, convenient, safe and effective for patients. In most cases, in-chair teeth whitening produces several shades whiter teeth in less than 1 to 1 ½ hour session. Results may vary from patient to patient, depending on the existing shade of the natural tooth and patient age. For best results, the dentist may recommend both in-chair treatment as well as a take-home whitening kit to help keep your teeth whiter and brighter. Contact Eastwood Dental to see if you’re an eligible candidate for teeth whitening. Eastwood Dental also offer take-home teeth whitening kit to allow patients to maintain whiter teeth in the comfort of their own home. The kit comes with a custom-made whitening tray and whitening gel which you apply yourself. Your dentist will be able to explain how to apply your treatment and how often to apply it. At Eastwood Dental, our experienced dentists are here to guide you on the best whitening treatment option for your situation. 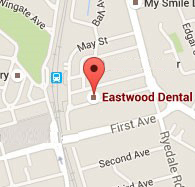 Contact Eastwood Dental on 9874 9900 to book in your appointment.